Nepal: China's Gateway to South Asia? China’s latest South Asian addition to the Silk Road: Nepal. As The Diplomat previously reported, China has been in the process of setting up two major infrastructure and transportation corridors between China and the Middle East and Europe. One corridor, the Maritime Silk Road, extends westwards through Southeast Asia, while the overland Silk Road Economic Belt goes through Central Asia. Both routes largely skirt around South Asia though this is not necessarily by design. Chinese officials have been cajoling India to join the New Silk Road though India has been reluctant to do so. However, many of India’s neighbors such as Sri Lanka, Nepal, and the Maldives have been eager to participate in China’s Silk Road project. Indian reluctance to join the Silk Road is partially fueled by its wariness of China making inroads into its neighborhood, but this seems to be happening anyway. Small countries like Sri Lanka and Nepal do not embrace Chinese investment to spite India, but for their own economic and political reasons. In a previous article, I warned that South Asian countries would begin to integrate economically with East Asian economies, especially China, individually if they could not do so as a bloc. Yet integration as a bloc within South Asia, in the manner of the Association of Southeast Asian Nations (ASEAN), seems unlikely because of the failure of India’s economy to open up enough or perform well enough to drive the entire economy of South Asia (Pakistan’s obscurantism is also responsible). Despite welcome moves by the Modi government, reform will be hard and slow and its effects will not be evident for several years. It is in this context that Nepal has decided to join the New Silk Road, marking the beginning of an overland extension of that project into South Asia. Last month, Nepal signed a four-point document endorsing the Silk Road. Nepal would be connected to a Chinese rail line in Tibet. China recently extended its rail network from Lhasa to Xigaze (Shigatse), a city just 253 km away from China’s border with Nepal and India. The plan is to extend the line to several sites in Nepal, then the capital Kathmandu, and then potentially to India. Nepalese involvement in the New Silk Road will enable Nepalese goods to travel throughout Eurasia and could spur an economic renaissance in that country. Nepal is currently connected to international trade routes only through India. Nepal’s relations with India have improved since Prime Minister Narendra Modi’s election in India but China is able to pour more money into developing Nepal’s infrastructure than India. Nepal’s connection to the Silk Road would mark the beginning of the Chinese project’s penetration into South Asia. It is highly likely that other countries in the region, such as Sri Lanka, the Maldives, and Pakistan, will also join the Silk Road at some point. However, India need not worry too much as it is still politically and culturally the largest player in the region — a fact that won’t change anytime soon. From an economic perspective, it is also to India’s advantage that its neighbors develop. Nonetheless, India should understand the trend of economic integration occurring in Asia and not stand aloof from it. 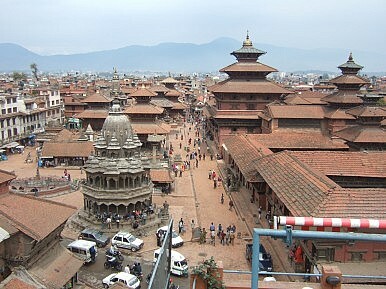 Amid a nadir in ties with India, Nepal's prime minister looks to China for an alternate source of economic opportunity. Nepal and the Regional Giants: Geography, Deliverables and LeadershipBIMSTEC and the Nepal-India-China TriangleIndia’s Nepal Challenge IntensifiesWhy Was the Pakistani Prime Minister in Nepal?What’s Delaying Nepal’s Tourism Boom?